Add an oriental note to your creations with the oriental Dukhan braid. 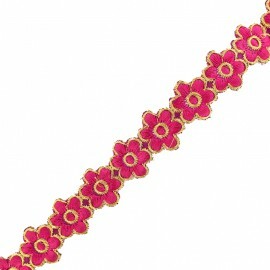 Its small golden beads and delicate embroidery in shades of pink, blue and gold will surprise you! 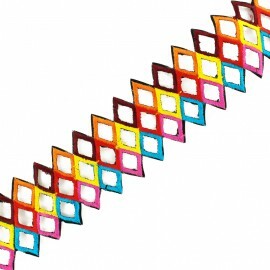 Create clothes or accessories that will suit you with this 40mm braid. Add an oriental touch to your creations with the Adja satin braid. 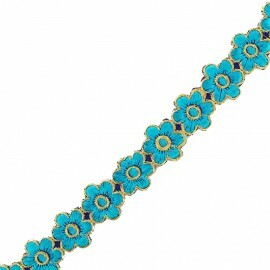 Its small golden beads and delicate embroidery with lurex thread will surprise you! 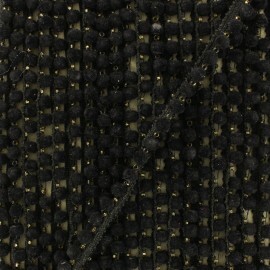 Create clothes or accessories that suits you with this 70mm braid. 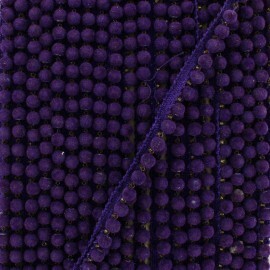 6 mm indian pompom trim with purple hardshell pompoms, add some colors and a bohemian spirit to your creations with our indian pompoms from the Hardshell collection. 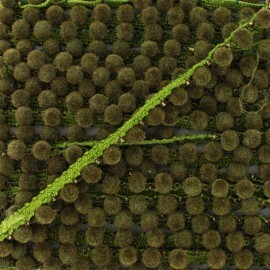 6 mm indian pompom trim with khaki hardshell pompoms, add some colors and a bohemian spirit to your creations with our indian pompoms from the Hardshell collection. 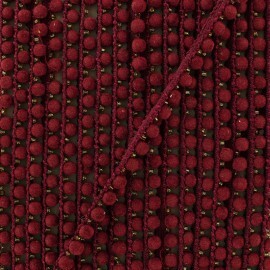 6 mm indian pompom trim with burgundy hardshell pompoms, add some colors and a bohemian spirit to your creations with our indian pompoms from the Hardshell collection. 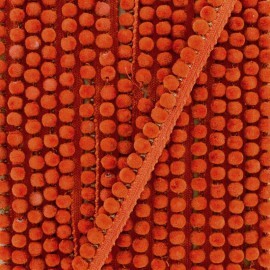 6 mm indian pompom trim with orange hardshell pompoms, add some colors and a bohemian spirit to your creations with our indian pompoms from the Hardshell collection. 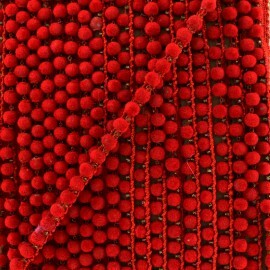 6 mm indian pompom trim with red hardshell pompoms, add some colors and a bohemian spirit to your creations with our indian pompoms from the Hardshell collection. 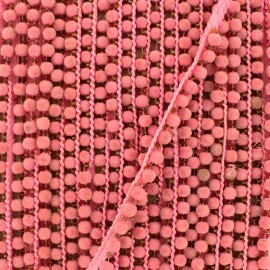 6 mm indian pompom trim with pink hardshell pompoms, add some colors and a bohemian spirit to your creations with our indian pompoms from the Hardshell collection. 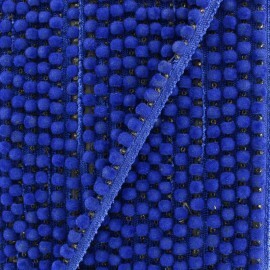 6 mm indian pompom trim with royal blue hardshell pompoms, add some colors and a bohemian spirit to your creations with our indian pompoms from the Hardshell collection. 6 mm indian pompom trim with black hardshell pompoms, add some colors and a bohemian spirit to your creations with our indian pompoms from the Hardshell collection. 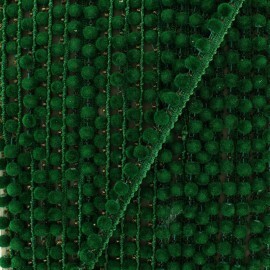 6 mm indian pompom trim with emerald green hardshell pompoms, add some colors and a bohemian spirit to your creations with our indian pompoms from the Hardshell collection. 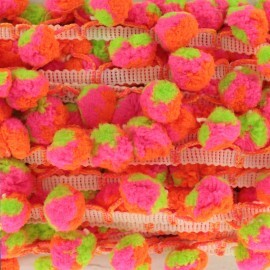 15/20 mm neon pompon indian trim with bold and trendy colors (green, fuchsia, orange), ideal to add some colors to your clothes and accessories. 35 mm iron-on trim with silver and caramel embroidered flowers, ideal to finish your curtains, cushions, interior decoration or accessories. 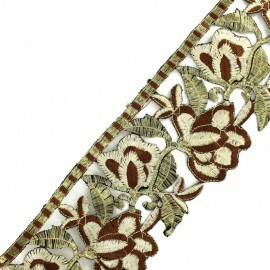 35 mm iron-on trim with silver (lurex) and caramel embroidered flowers, ideal to finish your curtains, cushions, interior decoration or accessories. 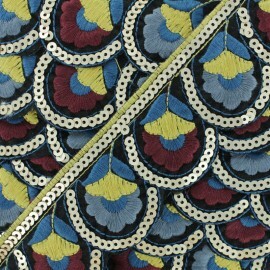 25 mm gold trim with multicolored tube beads embroidery, ideal to finish your curtains, cushions, interior decoration or accessories. 55 mm iron-on guipure with multicolored (yellow, burgundy, purple) gold thread embroidered floral pattern, ideal to finish your curtains, cushions, interior decoration or accessories. 55 mm iron-on guipure with gold thread embroidered floral pattern, ideal to finish your curtains, cushions, interior decoration or accessories. 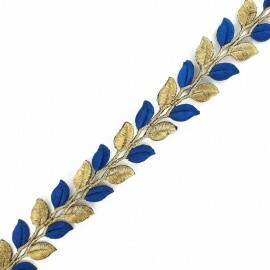 35 mm iron-on trim with gold and royal blue embroidered leaves, ideal to finish your curtains, cushions, interior decoration or accessories. 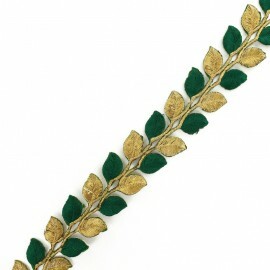 35 mm iron-on trim with gold and emerald green embroidered leaves, ideal to finish your curtains, cushions, interior decoration or accessories. 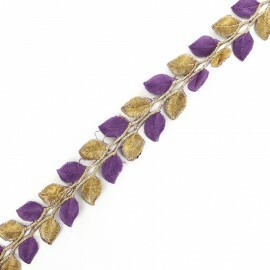 35 mm iron-on trim with gold and purple embroidered leaves, ideal to finish your curtains, cushions, interior decoration or accessories. 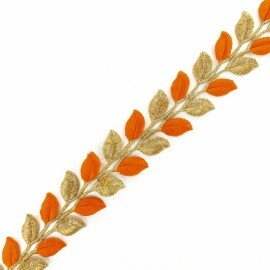 35 mm iron-on trim with gold and orange embroidered leaves, ideal to finish your curtains, cushions, interior decoration or accessories. 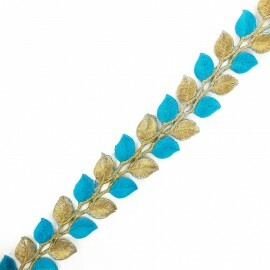 35 mm iron-on trim with gold and blue embroidered leaves, ideal to finish your curtains, cushions, interior decoration or accessories. 25 mm iron-on guipure lace with cooper (lurex) flowers. Finish nicely your accessories and interiors with this beautiful guipure that will add some fun and colors to your cushions, curtains or even bags. 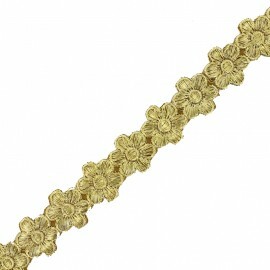 25 mm iron-on guipure lace with gold (lurex) flowers. Finish nicely your accessories and interiors with this beautiful guipure that will add some fun and colors to your cushions, curtains or even bags. 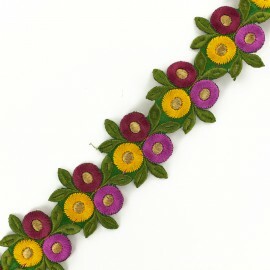 25 mm iron-on guipure lace with fuchsia and gold (lurex) flowers. Finish nicely your accessories and interiors with this beautiful guipure that will add some fun and colors to your cushions, curtains or even bags. 25 mm iron-on guipure lace with blue and gold (lurex) flowers. Finish nicely your accessories and interiors with this beautiful guipure that will add some fun and colors to your cushions, curtains or even bags. 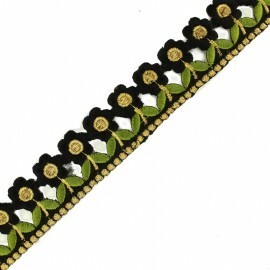 25 mm iron-on guipure lace with black and gold (lurex) flowers. Finish nicely your accessories and interiors with this beautiful guipure that will add some fun and colors to your cushions, curtains or even bags. 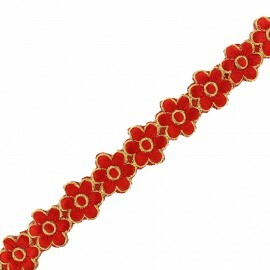 25 mm iron-on guipure lace with red and gold (lurex) flowers. Finish nicely your accessories and interiors with this beautiful guipure that will add some fun and colors to your cushions, curtains or even bags. 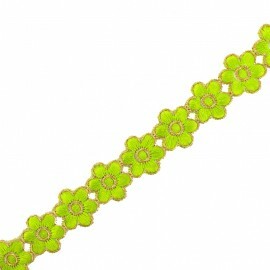 25 mm iron-on guipure lace with green and gold (lurex) flowers. Finish nicely your accessories and interiors with this beautiful guipure that will add some fun and colors to your cushions, curtains or even bags. 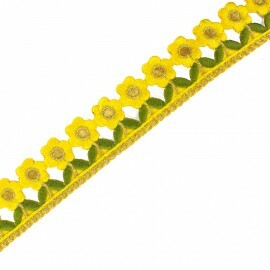 25 mm iron-on ribbon with yellow and gold (lurex) flowers. Finish nicely your accessories and interiors with this beautiful guipure that will add some fun and colors to your cushions, curtains or even bags. 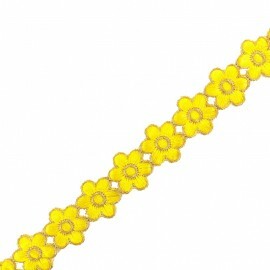 35 mm iron-on guipure lace with yellow and gold flowers. Finish nicely your accessories and interiors with this beautiful guipure that will add some fun and colors to your cushions, curtains or even bags. 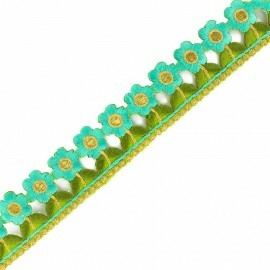 35 mm iron-on guipure lace with turquoise and gold flowers. Finish nicely your accessories and interiors with this beautiful guipure that will add some fun and colors to your cushions, curtains or even bags. 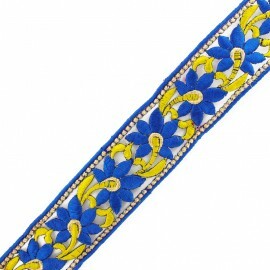 35 mm iron-on guipure lace with blue and gold flowers. Finish nicely your accessories and interiors with this beautiful guipure that will add some fun and colors to your cushions, curtains or even bags. 35 mm iron-on guipure lace with black and gold flowers. Finish nicely your accessories and interiors with this beautiful guipure that will add some fun and colors to your cushions, curtains or even bags. 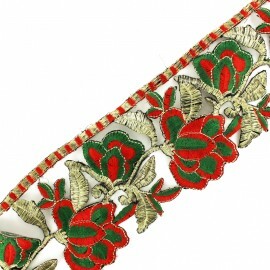 85 mm iron-on guipure lace with red and green flowers and gold leaves (lurex). Make beautiful curtains with this beautiful braid ideal for decoration and accessories. 85 mm iron-on guipure lace with khaki and brown flowers and gold leaves (lurex). Make beautiful curtains with this beautiful braid ideal for decoration and accessories. 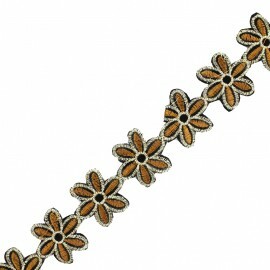 85 mm iron-on guipure lace with brown flowers and gold leaves (lurex). Make beautiful curtains with this beautiful braid ideal for decoration and accessories. 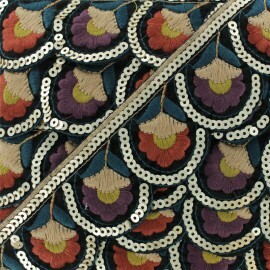 60 mm iron-on guipure lace with multicolored diamonds. Make beautiful curtains with this beautiful braid ideal for decoration and accessories. 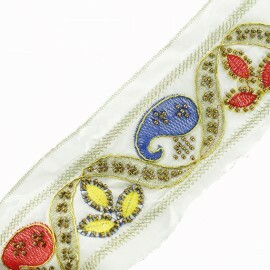 45 mm iron-on guipure lace with blue and gold flowers (lurex). Make beautiful curtains with this beautiful braid ideal for decoration and accessories. 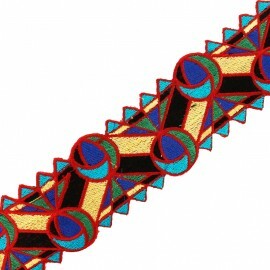 70mm iron-on trimming braid with abstract multicolored geometric pattern. Make beautiful curtains with this beautiful braid ideal for decoration and accessories. 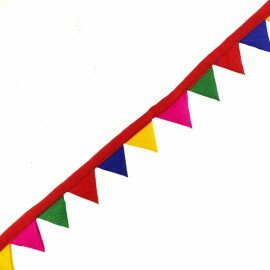 25mm red multicolored pennant ribbon ; give free rein to your ideas with this pretty ribbon for decoration or to decorate your accessories. 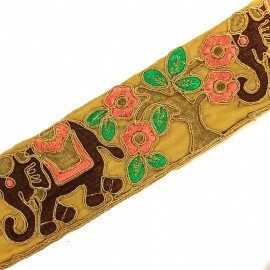 Beautiful 70 mm trimming ribbon with pink flowers and brown elephants on gold (lurex) background. 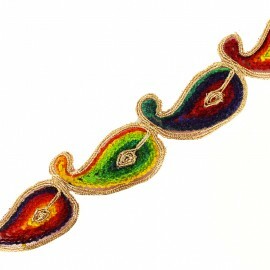 Add color to your creations with this beautiful embroidered braid handcrafted in India. 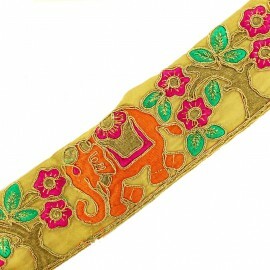 Beautiful 70 mm trimming ribbon with fuchsia flowers and orange elephants on gold (lurex) background. 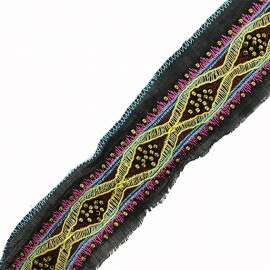 Add color to your creations with this beautiful embroidered braid handcrafted in India. 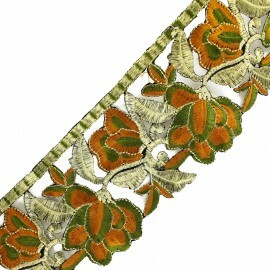 65 mm Indian ribbon with orange flowers embroidered on tulle. 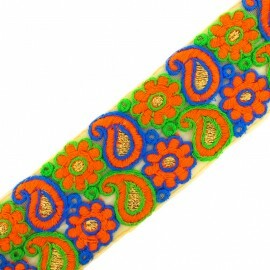 Add color to your creations with this beautiful embroidered ribbon handcrafted in India. 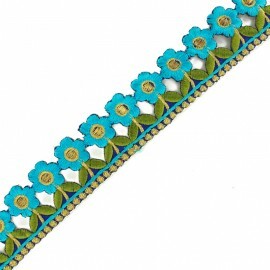 65 mm Indian ribbon with blue flower embroidered on tulle. 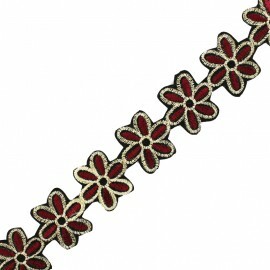 Add color to your creations with this beautiful embroidered braid handcrafted in India. 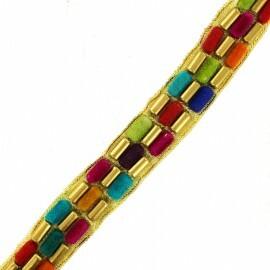 50 mm rainbow Indian guipure with gold edges (lurex). 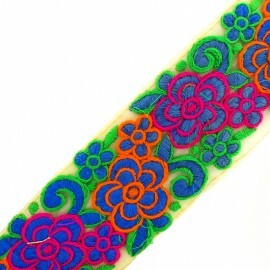 Add color to your creations with this beautiful embroidered braid handcrafted in India.